With each new release of SAP Screen Personas, we often receive requests about what is new. This allows our customers to determine when they want to upgrade, based on how much they want the new features. For example, we started supporting the SAP Fiori design guidelines in SAP Screen Personas 3.0 SP2, SAP S/4HANA in SP3, and the Belize theme in SP4. In response, we have created a feature comparison matrix. We hope this helps you understand some of the new functionality we release with each new version. Is there something you are looking for that’s not on this grid? It might already be in the product, as this is only a brief summary (the most recent SAP Screen Personas 3.0 SP4 contained over 250 new features). Or, just let us know so we can add it to the product roadmap. 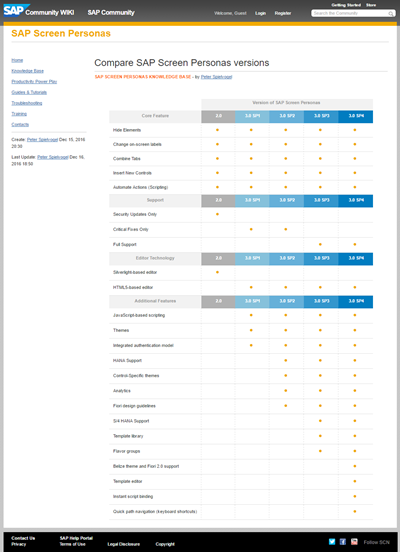 View the full-size SAP Screen Personas Feature Comparison matrix.